Haley has agreed to let me have a post. Finally. I’m not complaining it took so long, but still…I thought my friendship with her was such that she would’ve asked me ages ago. Anywho, my Rosemary Lemonade is very popular at Fitzpatrick’s—especially at this time of year. It’s so light and refreshing. Rosemary contains carnosic acid—which helps fight off free radicals in the brain. I think of it as a health drink. 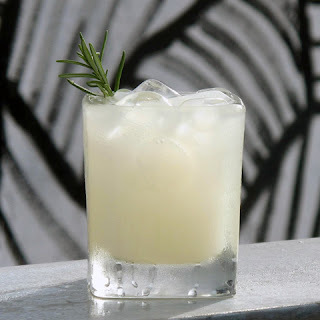 The most important ingredient in my Rosemary Lemonade is of course the rosemary infused vodka. It’s easy to make. Just plunk about ten springs of fresh rosemary into a bottle of vodka and tuck the bottle in a cool, dark place. A week later it’s done. The rosemary will turn the vodka a light brown. Don’t fret. Once it’s in the lemonade, you won’t even notice. If you don’t plan on using the whole bottle of infused vodka right away, remove the rosemary sprigs. Otherwise the vodka gets a little too herbal. At Fitzpatrick’s, I go through a couple of bottles a week, so I just leave it in. You can use any kind of lemonade, but I like Sanpellegrino Limonata. It’s the perfect balance of tart, sweet and fizz. Add the ingredients to an ice filled glass, stir, garnish and serve. About the garnish: a sprig of fresh rosemary is the obvious choice (and looks great in the photo), but my customers at Fitzpatrick’s complain that the rosemary goes up their noses when they take a drink, so I use fresh mint or a wedge of lemon instead. You can use the rosemary infused vodka in just about any vodka based recipe. It makes a lovely Bloody Mary. Hope you like my recipe. Leave lots of positive comments so Haley will let me have more posts. Cheers! And don’t forget to tip your bartender.